For shaders in the game, I didn't really want to go beyond the vertex shader 1.1 spec if possible. Keeping to that means more hardware T&L cards will be supported, but VS1.1 only allows 128 instruction slots. Of course, it will get emulated on the CPU, and for a game like Mr. Robot, we can probably get away with a fair amount of that, but every little helps. This however proved difficult with the coolant shader. It was already doing the lighting, and texture scrolling, and scaling of the textures in the vertex shader. The coolant object in Mr. Robot is a 1 tile unit cube scaled to match the appropriate size set in the editor, so I use a multiple of the vertex world position to scale the texture coordinates - that way, the texturing is all at the right scale no matter what size you set the water to be. After all that, there wasn't a lot left to play with, but I wanted to have a mess with putting a 'wobble' into the vertices just to make it a tiny bit more interesting. A pretty simple way to do this I thought, would be to apply a sine wave to the vertex height, based on the vertex horizontal position + time. The first thing I did was subdivide the top of the coolant object quite a bit (without any vertices to wobble, it wouldn't look very good at all!) Then after much messing around, I finally got something running at the right scale (Initial tests resulted in screen sized tidal waves ). Problem was, it was a little too regular. So, the solution to that is more waves: if you apply lots of waves though a mesh, all at different amplitudes, wavelengths and frequencies, you can make a pretty nice irregular wave pattern. I've actually done this before many years ago with multiple octaves of noise for a pre-renderered water animation. Pretty quickly though, I hit the vertex shader instruction limit, and so whilst I was testing, I dropped out some of the point lights (Mr. Robot supports ambient light, a single directional light, and up to 5 point lights per room). The problem with this kind of thing, is that it's always a matter of adjusting loads of parameters which all affect each other and so something pretty simple ends up taking all day Finally, I whittled it down to 3 sine waves - one running the length of the water, one along the width, and a much finer one at 45 degrees. With a bit of tidying up of the HLSL code, I managed to keep it all inside 128 instructions with all the lights turned on. This was a fun little effect to make for the teleporter. I used to love the really simple teleport effect in Lunar Jetman on the Spectrum, and so this is my mini-homage to that. Just a simple point emitter with very slow moving particles so they have some velocity and they can be velocity aligned. then they are just scaled along one axis - which since they are velocity aligned, and all moving away from a point turns the whole system into a big spiky orange ball. You'll have to excuse the 'home movie' shaky camera; it's an artefact of scrolling around for the video, whilst the game camera is also trying to smoothly track the player position. Anyway, it should be possible to see what's going on here. It's an 'X-Ray' type effect, along the lines of many recent RTS games that allow you to see your units through buildings. It works by rendering the robot mesh once looking red and partially transparent, but with 'zenable' set to false (so the shader doesn't use the Z buffer), and then again in a second pass using the standard shader (with Z-Buffer enabled). A little messing around with the order in which things are drawn and we can control whether or not the X-Ray effect will be seen on a per-shader basis. At this point, I'm not 100% sure if we'll be able to use it as I'll need to re-export any models that we don't want to see the effect on. Probably robots, crates and consoles should still obscure the player. Thankfully it's not necessary, as all the rooms are designed so you don't get confused by to much view-obscuring geometry, but it's a nice little feature for tracking exactly where you are. Asimov taking damage from a hostile robot. Asimov taking damage in shallow coolant. Lots of work on ghost hack gaming this month. I'm trying to get all the core functionality working so I can play through it all and finalise the design. To that end I'm trying to get the first part of the game fully working and integrated with ghost hacking. We have two modes that I call "reality" and "hacking". It's very important that they connect together properly so you can move easily between them. Picking up ghost hack items in the real world and being able to configure them on your avatar. Other robots giving you objectives to complete that require you to hack into something, recognizing when you do it and the appropriate dialogue firing. Being blocked by a door in reality, performing a hack, the door opening as a result. The first ~30 rooms introduce various characters and ease you into learning how the game works both in reality and in hacking. This is the bit I want to get completely working. Even though we don't have all the animations, the models, the items or the frontend screens completed it is important to show the core systems running and meshing together. This is a very powerful development technique in an environment where specifications are nebulous. Some people might find it strange, but developers rarely understand how the entire game will work in detail until it is almost complete. This is usually because the game is implementing ideas that are new to the developers. Note that I didn't say the ideas themselves are new, that happens very rarely indeed. Unless we just make Starscape sequels or games based on our old mainstream titles we will be working with ideas and concepts we haven't implemented before. In that situation you really need focus on getting things working quickly so you can review them. This technique is called prototyping and continues right through development until all the unknowns are implemented and working. In an ideal world you would create all the prototypes at the start and only when you were happy with everything would you begin production at which point there would be no more unknowns at all. The reality (especially on a tight budget) is the prototypes start out big and flakey and then over the course of the development the prototypes become smaller and more focused as the game locks in on its final form. What I'm doing now with hacking will probably be the last prototype phase in this development. I'm not trying to prove whether hacking works; I've already done that in a much rougher earlier prototype. Do all my item ideas work and have I forgotten anything. 'Items' refers the things you use to modify your ghost hacking avatars, like attack programs, defensive upgrades, restoratives, etc. Do the systems I've designed to synchronise reality and hacking together work as intended. This includes things like when all the avatars die during a hack and you get thrown back into reality and must then search real space for energon pickups you can trade in to buy their runtime lives back. One of the assumptions I made is that when you complete your hacking objective you'll have to work your way back to an exit to get out. There was no way of testing what that would really be like unless I had a rough prototype. How long the hack would take. How many resources I'd need to get in and out, which corresponds to how much preparation is needed before taking on the hack. How thrilling it would be "running" for the exit with a damaged party and limited remaining resources. How annoying it would be to get killed next to the exit. Use playtesting to make it easier to get in and out reducing the chance of you being killed near the exit. This means putting things off until the playtesting phase in beta. Throwing the player out of hacking mode when his objective is complete. I don't actually want players to have to save their game. Eh? Currently we have in game objects called backup points where you can save your "brain" and restore it if anything goes wrong. A slight twist of logic, but I think it works. So the player makes progress up to the next backup point (or waypoint) and then jumps on it and the game saves automatically. So you don't have multiple saves and you don't need to remember where you got to last time. You just start up the game and there you are. As you strike out for the next waypoint you will have 3 lives which can be exhausted by falling in water or being caught by enemy robots. If you run out of lives you automatically reset to the last waypoint. You can recover your "life" if it gets low by picking up energon units and if you get stuck you can initiate a local reset of the room you are currently in (at any time, for free). It's another set of ideas that really need prototyping. I'm trying to prevent people going through a loop of explore->die->reload->repeat. Yet I want them to feel the tension of being down to their last nugget of health and desperately searching for that elusive waypoint. A fine balance to achieve indeed. The way this is implemented requires a copy of your current game save to be loaded into memory. Then, as you progress, the in-memory save is updated with what you have done. If you die or elect to go back to the last waypoint then the in-memory save is thrown away. If you hit a new waypoint then the in-memory save is written to disk and becomes permanent. The amount of information that needs to be recorded is huge. For example: if you move something from one position to another then that needs recording. Anything and everything you can interact with and change in any way needs recording and it all needs to be put back where it was and in its original state if a reset occurs. I spec out a room design, and start to block it in. If there are any scenery objects that I require for the room that don't exist yet, I tell Fost, and after we've discussed what it might look like he exports a quick placeholder object of the right size which I use to continue building the level. As soon as Fost gets round to it, he exports the finished object, and because we've already defined the object (but used a placeholder visual representation) every room that needs it automatically starts looking good the next time the game is fired up. This saves a lot of time, because we don't have to go through and re-edit the rooms re-inserting finished art. The flipside is it requires a lot of imagination to visualise what the final room could look like. The picture below is of the 'Hub' room work in progress. It's the central command area for the entire ship, and all sections are accessed from it. Hopefully, Fost will be able to post a comparison shot next month and we'll get to see what it all is supposed to look like - even I don't know yet! If we manage to ship the editor with the game, everyone will have a far better experience than I have, because they'll be able to build rooms using finished artwork and room will looks exactly the same as how you are building it in the editor. The Eidolon's Central HUB built from placeholder blocks. Note-In case you hadn't guessed, it's not supposed to look this bad! Feburary and March have been busy months for me, unfortunately alot of it hasn't been strictly game development (Talking, planning, organising, designing and so on) so I don't have as much to share as I'd like, but I'll do my best. Definitely the highlight of the month, I've just taken on board the awesome swedish band Machinae Supremacy, who will now be composing the soundtrack for War Angels. I would go on about the great work they're doing, but I'll let it speak itself. I've uploaded two short song samples which you can hear by following the links below. If you're interested in hearing more from the band they have a huge amount of songs available on their site, specifically the discography section. When I haven't been dealing with overhead tasks, or playing Battle For Middle Earth 2, I've been hard at work on the second level of War Angels. I decided to do a new map now seeing I had all the required game features to build it from start to finish. Level 1 isn't completely done, but it requires some features that I haven't put into the game yet - indoor maps, sub-objectives, and so on. By going ahead and making Level 2 now I can time how long it's going to take to finish an average map and get a decent estimate on how long this game will take to finish. Each level is divided into a few sectors for ease of editing. Pictured below is one of the sectors in two stages of development. First I lay out the place in cubes and floor tiles, as seen in figure one. Then I throw it to the game editor where I place enemies and objects and create the 'gameplay' for that particular sector. There's alot of tweaking at this stage, going back to the map / object editor and moving stuff around for the best playability. This takes about a day. When that's done I go back to the map editor and fill in all the details. This is where it moves from the picture you see on the left to the picture you see on the right. This only takes about two days if I have all the textures I need. Creating new textures will inflate the time I need to create a sector quite a bit, but I haven't measured this properly so I can only speculate about it. Hitting the right balance of creating interesting and varied looking levels without taking years to do so is one of the biggest factors deciding how long the game will take to finish, so it's important to get this done as soon as possible. Here are some screenshots of the map in action - the levels not completely detailed, but hopefully detailed enough for it to look good. Mechs have been in the game since as long as I remember, and now I've finally finished them off so they can appear in this map. There's two varieties, the weaker conscript mech which will appear in this mission (pictured), and a stronger Nazi mech with a deadlier selection of weapons which include a chaingun, a flamethrower, a missile launcher and a laser beam. You'll also be able to pilot one at some point in the game which you can see briefly in my last dev diaries video. These autonomous turrets differ from the norm in that it's usually easier to avoid them than attack them. If you step through their laser detector, or fire at them, they'll retaliate with a burst of highly accurate gunfire. I've been using them to provide some variety to level 2 by breaking it up into small "nazi sections" and "turret sections", one which has you shooting up enemies and the other has you dodging laser beams. There won't be any undestroyable enemies in this game though, so they can be dispatched if you have enough heavy weaponry. 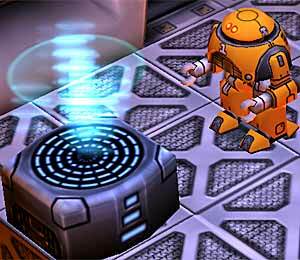 The patrol bots from the first level can now be fitted with gravity generators instead of grenade launchers. These guys will drive up to you and deploy, creating a strong gravitational field around them pulling you in. I came up with this one when one of my friends was running through the first level, and pointed out that you didn't need to fight any of the enemies - you could run past them all to the end without them being able to catch you. With this enemy is place that strategy is going to be alot less effective. I like the idea of enemies who do things to you other than take off your health so expect to see more like this one. Note: Sorry for the lack of video this month, I started this diary a bit late and we didn't have time to make one. Next month hopefully! Looking sharp guys, can't wait to try these out. So, is it looking like both Mr. Robot and War Angels will have a map/level/unit editor? Also I'm curious to know more about how the tools your working with now would speed development up on your other projects. I remember way back, when the gears shifted from Battlescape to Mr. Robot, there was some talk about how some of the things your doing there will actually help you work stuff out better for that title. I guess I'm asking what processes you think will transfer over to Battlescape from the things your learning from Mr. Robot. Wow, amazing new stuff from all of you folks! And this time, I was even able to follow Poo Bear's post as it concerned less coding and more pure gameplay. The water, the x-ray vision and the teleporter all look just amazing. You've also just now proven that I should never get into advanced game graphics (anything beyond Bork is obviously beyond my reach) the moment you posted that bit of code. Coding is one of those things I'll never be able to do. The gameplay sounds fun. The checkpoints are a nice way to add tension to the game, and I'm all for it. Will there be a "continue from where you left off" option, though? As in, if I have to switch off the game and I'm, like, a half hour past the previous check-point... Will I have to start from that checkpoint again, or will the game boot from where I was when I quit? Sort of like in the roguelikes where you can only save when you quit in order to avoid the "let's save right before the big fight so I can try again right away if I fail." deal that you get, for example, in Morrowind? I don't want to be given too much freedom to save, but I don't want to have to do a whole lot of stuff over just because I had to leave two minutes away from the next checkpoint. Also, War Angels is getting me riled more and more with every diary. I haven't checked out the music yet since I'm at work, but I'll have a look when I get home in the evening. Level 2 looks great, and the patrol bots are a great idea. I like this way of thinking that they can basically just hamper you so the OTHERS can kill you instead of everyone just trying to get you. How about a shield-generator that generates nearly impenetrable shields on OTHER units? You COULD bust through the shields and go at the shielded folks, but if you want to do it quickly, you'd have to get past those to get to the generator which is hiding behind them or something. I dunno. Just something off the top of my head. Probably silly in-game, though. Which do you guys estimate will be done first? Mr. Robot or War Angels? EDIT: Darn it! Missed! I shouldn't make such long posts, I'll just keep losing that first reply. If we do our job correctly there should never be more than 5-10mins of play time between save points. So no you cannot save whenever you like. I'm a big Resident Evil fan, in the first games you had typewriters as save points and they were far too spaced out, plus you needed "ink ribbons" to power them up so you could save. Terrible. Resident Evil 4 gets it spot on, the typewriters don't need ribbons and are far more numerous. They've also made sure to put a typewriter outside any majorly difficult encounter. I understand that games haven't always setup fixed save points correctly in the past and therefore people are often worried when they hear they cannot save where they want. However, I hope we get it right, like Resident Evil 4 did, so that fixed save points add tension/excitement to the play without becoming annoying. MrRobot will be completed first. Mr. Robot looks about 50/50 right now. There's a lot needs doing to the editor that we definitely can't do for version 1.0 - so I'm already sure the editor won't ship on initial release. However, we are always working as if we will release it at some point - I even keep updating the help file, and we are maintaining a list of what needs to be done to make it shippable. The main things are game related; there's a ton of things you can do in the editor that cause the game to break. We just know about them, and work around them, but ideally, the game should know how to handle such odd situations, so anything you make in the editor will work. 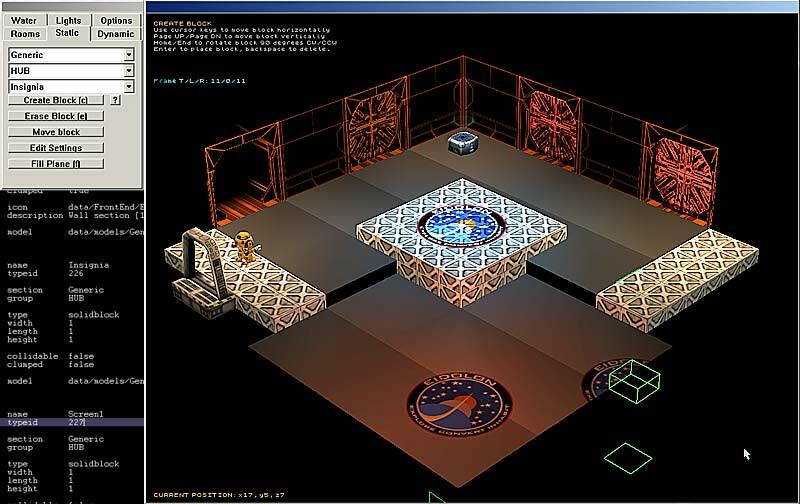 At the time, the 3D engine was very primitive, and so we couldn't implement a lot of the features we wanted in Battlescape. Certain shader features, particle effects, basic animation and it's control systems (the animation requirement was the prime reason we chose to make Mr. 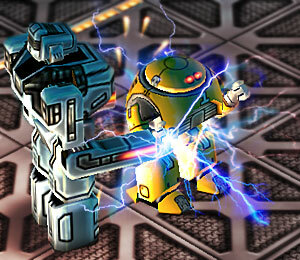 Robot as part of Battlescape's technology path). Also, somewhat unrelated to Mr. 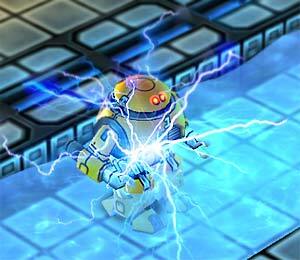 Robot - we wanted time to work on networking, which we have been doing on and off throughout Mr. Robot development. Matters have however been complicated since that decision was taken. Obviously, Goober leaving left a big gap, and whilst he's been extraordinarily helpful when we've needed to do something with his code, we ideally want to be completely self reliant. In the past year or so, a few open source and commercial renderers have appeared on the scene that we feel do everything we need, and so it's looking pretty likely we'll switch to one of those for our next project. We've already started abstracting some bits of technology so they can be more easily moved to another renderer, and have even integrated some with one rendering engine. We'll talk about that a lot more once Mr. Robot is finished though. That sounds Great, Poo. I wasn't really worried that you'd do it wrong, but it's still a relief to read you reply. I'm not so likely to get into the beta, so it's great to have this chance to get a feel for how you're balancing things out, etc. I wanted to say how much I like this whole development diary in the forum. I've seen other Dev diaries, but they've often been kind of vague and not really informative, and they CERTAINLY haven't been in the form of a forum thread which we could reply to and get replies back. This is changing these days, I think, now that the indie game-dev scene is expanding (or appears to be to me, at least) and it's going to be really interesting to see what happens on this front in the future. You can happily pat yourselves on your backs knowing that you're making history with these things. KUDOS! And on a semi-related note based off JNG, Will Moonpod consider distributing Mr. Robot or War Angles via other online distributors? I would reccomend trying Totalgaming.net as an avenew for that..
Everything is looking great! I dont exactly like the gap between diary entry's but they are allways full of great content and insight into how the games are actually shaping out! Sorry, I don't think I'll ever be making the editing tools for this game public. I use 2 third party programs outside of the ingame editor to make the maps, the whole process isn't very user friendly at all. Well, Do you reckon you could release some instant action map-packs? Most probably. I would say 'definitely' but I've found it's not good to promise anything when you're making a game. I have lots of ideas for high-score instant action maps. I want to get some in on release, but if there's no time I can release them as map packs. Easy: Profiles, like in Starcraft/ Warcraft.